The Canada Iron and Metal non-ferrous warehouse has a distinct reputation for being one of the most honest and fair non-ferrous buying scales in Toronto. Our warehouse manager has been constantly cited as being the most respectable in the industry which is why our returning customers account for over 85% of our non-ferrous business. This is something we are proud of at Canada Iron and strive to increase that number on a daily basis. At Canada Iron we understand that non-ferrous recycling is a major part of most industry these days so no matter the material, you are always getting top dollar! Are metals that do not stick to a magnet (contain no ferrous/Iron). Non-ferrous metals are all derivatives of metals found in nature and listed on the periodic table of elements. For example copper is listed on the periodic table of elements as Cu, Zn is the element for zinc, PB is the element for lead, Al is the element for aluminum Au is the element for gold. I guess you get the point so what is the deal with scrap lead, scrap copper, scrap zinc. Non-ferrous metals metals are difficult to mine using conventional methods. Converting a copper mine to pure useable copper requires a significant amount of energy and resources. This is the same for other metals like, aluminum zinc, and lead. Typically non-ferrous metals are more valuable because they are a more scarce a resource. Individuals and businesses use non-ferrous metals all day everyday. Just look around your room there are cables (made of copper or aluminum) your pots and pans are likely made of aluminum or stainless steel (stainless steel contains Fe and is therefore a ferrous metal), brass faucets, wires for your television/electronics. Even the computer or phone your reading this website on has little bits of copper, gold, aluminum and zinc inside of it. Copper is the big one for recycling and for good reason. It is the best conductor of electricity in its price range. Some elements like gold can be stronger energy conductors however for $11,000 plus an ounce it doesn't make economical sense. It’s amazing how many times we use copper daily from house lights and drain pipes, to cars washrooms, fridges, stoves, piping etx. Copper may not be found in the most glamorous places, however it certainly performs an important function. I guess you get the point, non-ferrous metals are everywhere. But what does that mean to you? 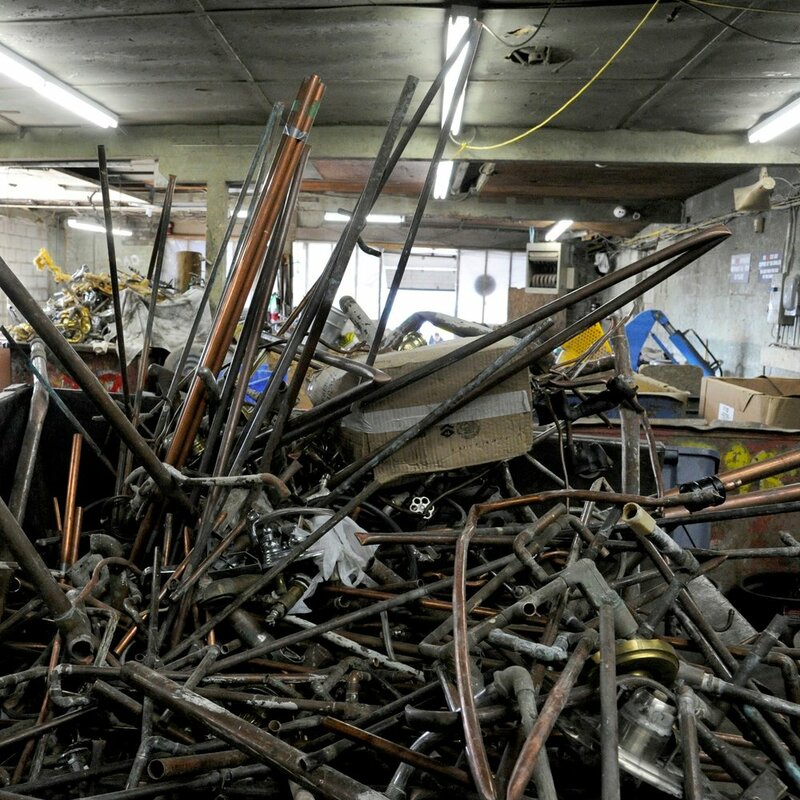 Whether you are in industry, manufacturing, demolition or an individual consumer, you will come across scrap metal. Canada Iron and Metal works with all levels. Whether moving large obsolete equipment, cleaning a warehouse or facility, completing a demolition project or just want to cash in your old scrap metal we want to work with you for all your “scrapping "- (recycling) needs. As a general rule the cleaner (more pure and without contaminants of other metals), the more the metal is worth. Copper wire with no plastic jacket will always fetch a higher price than copper that has a plastic coating. Aluminum doors will always be priced higher when all metal rivets and glass are removed. pricing for specific metal is based on the current prices that are published on international commodity markets such as the LME (London Mercantile Exchange) and the AMM (American Metal Markets). Prices are based on global inventories as well supply and demand. Most commodities are priced in USDs so as the American dollar changes so do the prices of scrap metal. Pricing for scrap changes quickly which is why the best way for an immediate pricing quote is to contact your local scrap yard for current pricing. Regardless of if you choose to clean your metals for the highest price or want to do your part and recycle non ferrous scrap metals. It is important to recycle these items and keep them out of landfills.